Friday the 13th is upon us, in 2013. 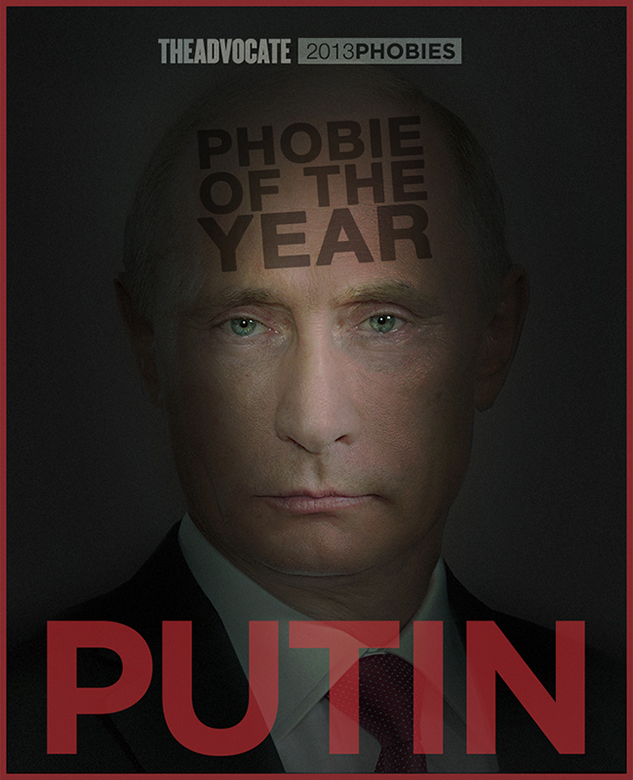 Let's review the year's 13 biggest homophobes with The Advocate's annual Phobie Awards. To hold the the president of Russia responsible for every antigay incident within his country's borders might be unfair. But it's far less offensive than what's happening to LGBT Russians. A neo-Nazi group is posting video of gay men it captures and then tortures by humiliating and often violent means. Someone threw poison gas into a gay nightclub in Moscow in November, and that was the second time it had been attacked in a week. The first time men showed up with guns and shot at the front door indiscriminately. Meanwhile, Putin is touting his Olympic Games in Sochi, suggesting that maybe the series of antigay laws he signed won't be enforced. In 2013, Putin signed a law banning any foreigner from adopting a Russian child if they come from a country supportive of marriage equality. Now the standard is so strict that Russia's Children Rights Commissioner says only Italy is narrow-minded enough to meet the qualifications. And Putin famously signed the so-called gay propaganda ban this year. It's a law so vague that Olympians could be fined or jailed for kissing their partners. Putin told the International Olympic Committee that he will do "everything" to ensure guests are "comfortable" in Sochi. But he's also banned protests of any kind there while the games go on. And photos of those daring to protest the law already show vicious beatings as a result. This is the sort of thing that Pride parades were invented to combat. But we're now one year into a 100-year ban on those in Moscow thanks to a law passed in 2012. Capping off the year, just this week Putin gave a speech in which he said Russia was right to reject "so-called tolerance, being genderless and fruitless."